Description: This is a tub of 18 different stamps made by the Hero Arts Company. Called Ink N Stamp, you get 18 different stamps and 2 mini ink pads. You get in this set 12 different flower stamps, 3 different vase stamps and 3 different stem & leaf stamps, as well as a Purple ink pad and a Pink ink pad. Very Cute!! Description: This stamp set is made by Hero Arts. 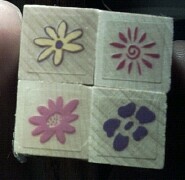 This great set of 4 different Flower Blocks stamps come in a cardboard box with colored lid. Each stamp is unique and perfect for any project!! Part of the Quatro Elements line. Description: This stamp set is made by Hero Arts. 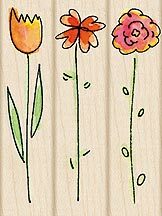 This great set of 3 flowers is a wonderful set for any card idea. Description: This stamp set is made by Hero Arts. This great set of 3 is perfect for any stamp collection. Description: This is a set of 4 Quatro Elements stamps by Hero Arts called the Flower Shadows collection. Stamps are the 3 flowers and one small shadow stamp. Perfect for Tag Art and Collage. Size: Each is 1" x 1"
Description: This is a stamp set from Hero Arts that is part of the Stencil Prints collection. In this set you get 6 different stamps. You have here 4 different flower arrangements and 3 different vases to make a wide arrange of looks when mixed and matched!! Description: From Hero Arts comes this set of 4 stamps that are part of the Poetic Prints line. 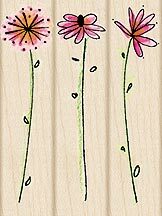 Patterns & Petals is a gorgeous set of 4 flower stamps with patterened backgrounds. The uses for this set are endless!! Description: This set is from Hero Arts and are a wonderful set of 3 wood block stamps. These would look great using watercolors and markers to create a hand painted look. These are part of the Pocketful O' Posies collection. Set comes in a small box. Size: 3/4" x 3" each. Description: This is a very nice set from Hero Arts and is part of the Special Edition collection. Set comes in a cardboard box. Use these wonderful original designs to create handmade greeting cards. Stamp in black and add a soft wash of color with chalks, watercolors, or pencils. Sayings are "Friends", "Blossoms, blossoms, everywhere!" and "Enjoy Simple Pleasures". Size: 1 1/4" X 2", 2 3/4" X 2", 4" X 1"
Description: This is a set of Tiny stamps from Hero Arts. Titled Four Posies, these stamps are of 4 types of flowers. Cute for envelope decorations or for making your own background paper. Description: This wonderful set is designed by Anna Griffin. Set contains 6 indexed, wood-mounted stamps with self-adhesive images, 4 1" X 1" pigment inkpads, 2 yards of ribbon and a project sheet in a reusable keepsake box w/ magnetic closure. The stamps shown are of a large flower, a topiary, a sunflower, a bouquet, a fleur design and a banner with the saying "Thank You" in script. Inkpads are pink, green, black and gold metallic. Ribbons are pink and green.